On February 16th, 2015, By-the-Lake Park in Wetaskiwin was a flurry of activity (and snow) as happy families and friends participated in the annual Family Day celebration hosted by the Rotary Club and Catholic Social Services, Sign of Hope. Guests were provided with a fun-filled day of activities such as horse-drawn sleigh rides, ice skating, tobogganing, RCMP, Wetaskiwin Fire Services and EMT displays and an open water rescue demonstration. A steady flow of people entered and departed the By-the-Lake Park Hall where they were treated to complimentary hot dogs, doughnuts, and hot chocolate. After warming up in the Hall, people filed down the pathway towards the open-water section of By-the-Lake Park. Wetaskiwin Fire Services (WFS) convinced Councillor Neilson that they had practised and were proficient in winter open water rescue and that he would make and excellent ‘subject’ for a rescue demonstration. It wasn’t like that in 1989 as the province did not have civic holiday in the month of February recognizing Family Day in Alberta. That was about to change. Premier of Alberta, Don Getty, felt it was important for Albertans to take a day off from work and spend time with their families. He proposed the new holiday that was intended to emphasize family values. In 1990 the new holiday, Heritage Day was proclaimed by Lieutenant Governor, Helen Hunley. This new holiday in Alberta was unique. Alberta was the only province to have a holiday in February until Saskatchewan offered a similar holiday in 2007. Today Family Day is a statutory holiday occurring on the third Monday of February in the provinces of Alberta, Manitoba, Ontario, Prince Edward Island, and Saskatchewan. It is observed on the second Monday of February in British Columbia. In the province of Manitoba the holiday is referred to Louis Riel Day and in Prince Edward Island as Islander Day. As Family Day is a provincial holiday, federal employees in all provinces (such as public servants and postal workers) work on this day. 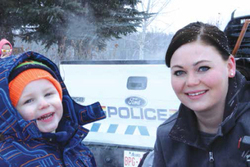 Pictured: Samantha Codrance and Riley Gregg were happy visiting the RCMP display on Family Day. Photo by Barry McDonald. See more event photos in this week’s paper.